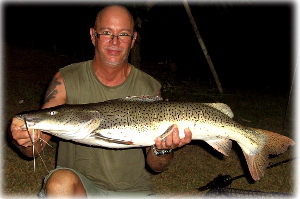 The Tiger Shovelnose catfish or Barred Sorubim as it is also called is a native of the Amazon basin but has been introduced to many fishing lakes in Thailand like Dreamlake Fishing Resort. Thais like to call it the Plah Tiger. The Shovelnose will take live and dead baits aswell as earthworms and chopped meats. A very good fighter which will stick to the bottom and make charging runs to snags. Generally regarded as a nocturnal feeder.